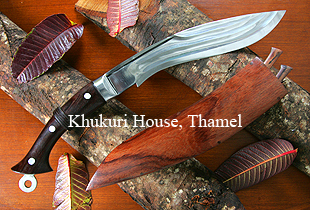 Yet another Khukuri blade by Khukuri House, Thamel known as the "Khu-Churi". This unique new blade looks more straighter like a knife known as Churi in Nepal, hence the name. Yet another Khukuri blade by Khukuri House, Thamel known as the "Khu-Churi". This unique new blade looks straighter like a knife known as Churi in Nepal, hence the name. A new feel, a new look, crafted in a new way and a new master piece by the most skilled master craftsman of Khukuri House. Here's how this Khukuri blade is different with others. 1. The shape of this knife is different to the rest as it appears straighter like any other knife. 2. The feel of this blade feels different because of its new shape and spine thickness of 0.8cm makes it light like carrying a knife and not a Khukuri. In other words it’s a Khukuri that looks like a knife or vice versa. The blade alone measures 400 grams so it is a light Khukuri good for light work. The widest part of the cutting side is only 4cm. 3. The crafting of the blade is special as three "Chiras" are forged which adds craftsmanship and balance. A new knotch instead of the old is added too. 4. The handle too is shaped differently maintaining good grip and never bruises users palm when in use like the old traditional handle does. 5. The scabbard too is unique with this Khukuri blade than to any other blades crafted before. There is just wood and no other materials like leather, brass or white metals making this case a really special. A new Master piece from the stable of Khukuri House, Thamel.